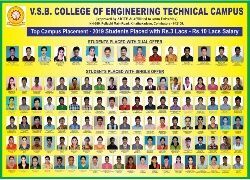 V.S.B College of Engineering-Technical Campus has a Unit of NSS functioning in a successful way. There are 150 active volunteers from different disciplines. With the goal to work for the betterment of society and to instill the spirit of social service among the young students, the NSS Unit is established in our College. Our NSS Unit aims at demonstrating the motto “NOT ME BUT YOU” in its day to day Programmes by effectively upholding the need for selfless service. Our NSS volunteers are being involved in various activities for the benefits of the institution and the students. They are working with social responsibility and for the development of the nation. They have the spirit of service to fellowmen. We succeeded in the past and we will continue to do so in the future also. Several activities are conducted inside and outside the college campus as listed below.